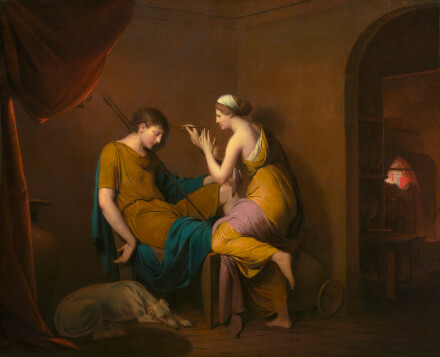 It’s The Corinthian Maid, circa 1783-84, by Joseph Wright. I found this on one of my many frequent visits to the National Gallery of Art while assigned to the Money section at USA Today. A postcard-siz ed version has been ensconced in an ornate frame on my desk for decades. To me, this seemed reflective of my relationship with my muse. Sometimes, she seems to be drawing ideas out of me. Sometimes, she seems to be using the implement to insert ideas into my brain. Dumbledore’s magical pensieve struck a personal chord when I read of it and applied it to this painting. The truth, I eventually learned, is that the painting depicts a practice that existed long centuries before photography – a lady tracing her lover’s image on the wall before he goes off to war. But this painting is not a single frozen moment in time. It is a doorway. A portal. And with that arises a tempest of possible plots and subplots, story arcs and character arcs, scenes and themes. And so the painting means all the things I wanted it to mean and more. So much more. Should I write them, read them, or both?